I love everything about tying flies. The learning process, the incremental and visible improvements as you learn, the history of various patterns, the delicate and subtle differences in hooks and threads, and most of all, the materials. A beautiful cape, a partridge skin, a thick slab of deer fur, a mottled turkey feather...for me, they're one of the few remaining connections to a childhood spent in the woods of the northeastern US, a place I'm both physically and chronologically far removed from. And yet all the expensive and hard to find animal parts we might be used to in the world of trout flies pale in comparison to the breathtaking world of salmon flies. 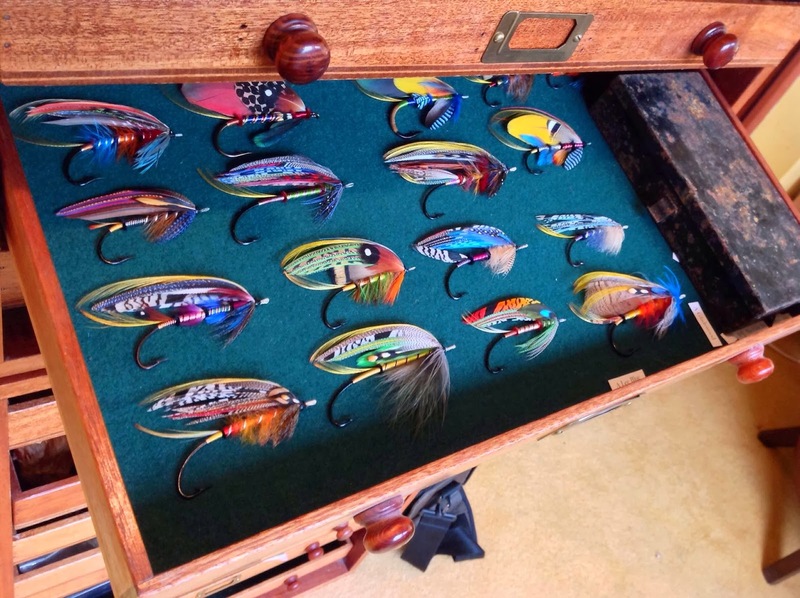 With a history as rich and vibrant as the flies themselves, they are the epitome of fly tying, elevating the art to a whole new level of skill, artistry, and yes, expense. Handmade hooks with eyes made of gut. Incredibly rare and expensive feathers and furs. 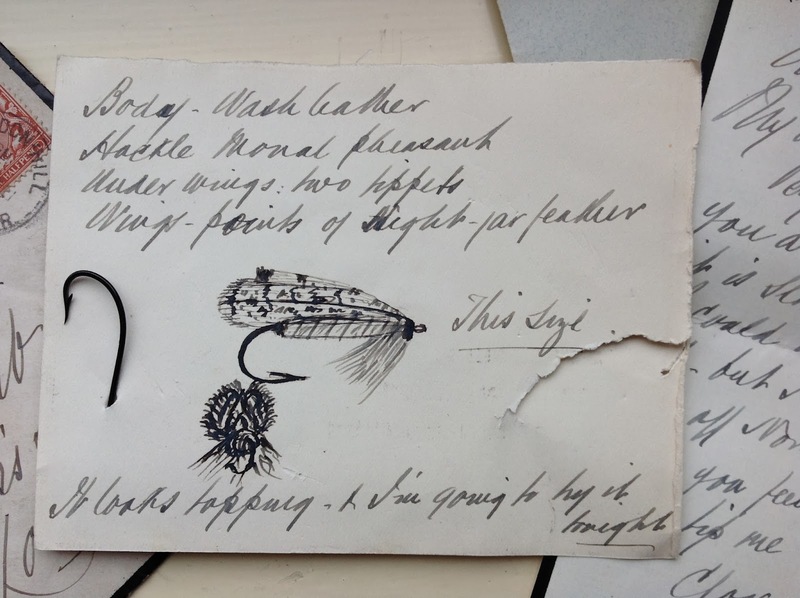 While my conventional tying materials may harken back to a childhood in the rural US, the materials used for salmon flies are intertwined in the history of the last great empire, gathered from the furthest and most remote corners of the world to end up on the hook of a well-heeled fly fisherman in the British Isles. 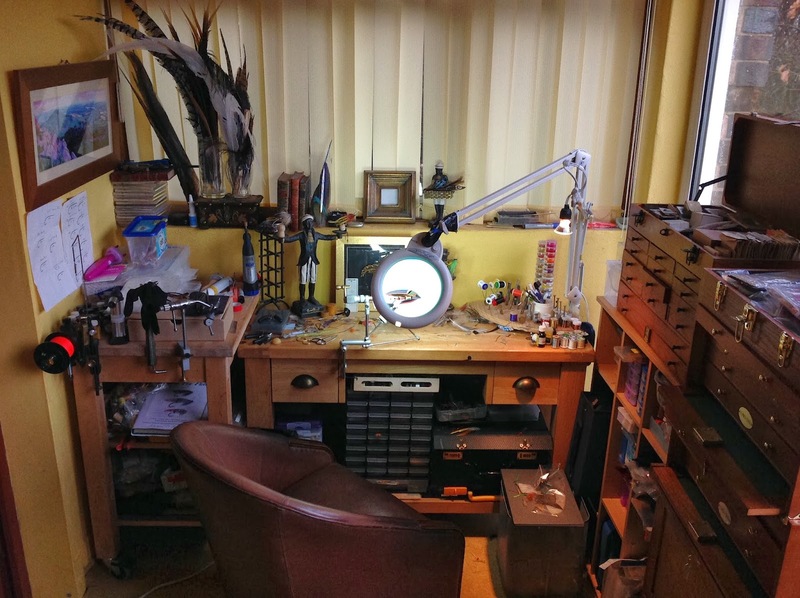 How long have you been fly tying, and how long have you been tying Salmon flies? I have been tying for about 3 Years, and started with Salmon Flies. After a life in Adventure Sports I wanted something that would be relaxing, and something that I could do on my own...however my endless pursuit of rare materials has proved just as stressful at times. 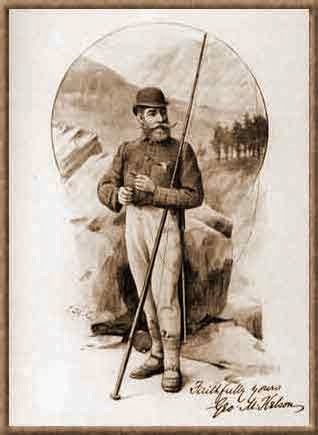 I spent half my life running an Adventure company around the world, but now I have somehow migrated into the world of People Development. I am a freelance Leadership and Change Consultant, working all over the world, with a hectic schedule of airports and hotels - but it does leave time to scan the internet for goodies. Do you spend more time fishing, or more time tying? How many hours a week do you spend tying, roughly? 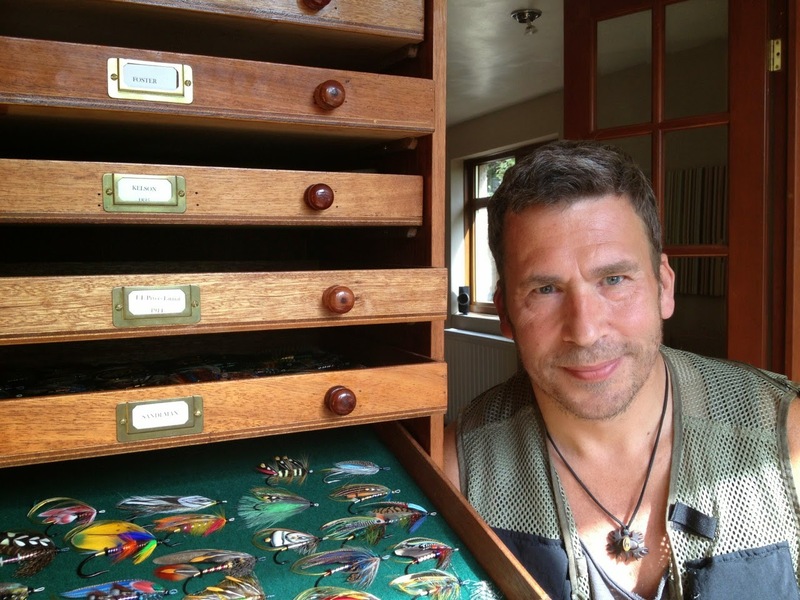 I spend much more time tying, and occasionally fish for trout locally to where I live in Staffordshire in the UK. I usually tie once a day when I am at home...which is not often at the moment. When you tie, do you have a routine? Do you listen to music, work in small amounts at a time, or do you sit down for hours at a time? I usually listen to Music, with a glass of wine...., and typically work all the way through without stopping, which might mean from making the hook to the finished item in a frame...A hook and fly normally takes me about 3-5 hours. What's the cost of entry like for an aspiring Salmon fly tier? What are some tips you might have for someone who'd like to get started? The best way to get started is to join one of the many forums, and learn from the experts...they will also point people in the right direction for materials. To start it is not expensive, but if you get serious it is becoming an expensive hobby due to the cost of rare feathers and hooks. How do you acquire most of your materials? I noticed you posted some photos of tying materials purchased at auction, have you made any amazing finds? 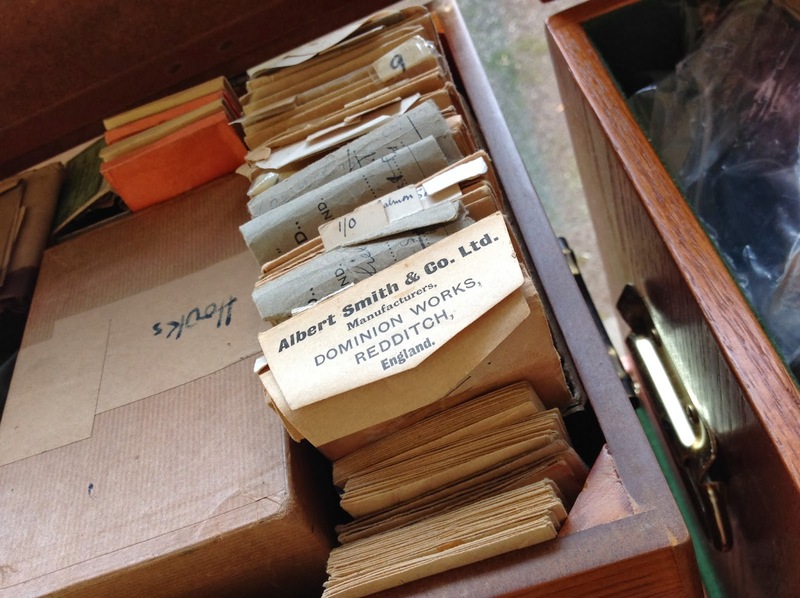 I made my first big auction find which inspired me to look for more about 2 years ago...when I acquired about £4000 of vintage materials for a paltry £76......since then I have had several others similar...and now I do not have to invest any more money I acquire materials and items by trading, and raising money by selling flies and hooks to spend on auctions. 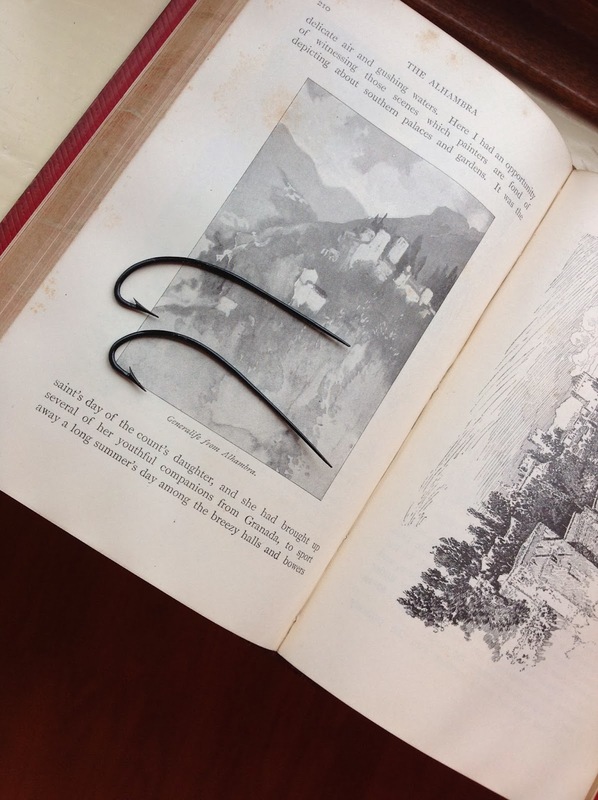 I probably have one of the largest collection of vintage salmon hooks in the UK now...maybe 7,000 hooks or so of all sizes and ages. There is still stuff out there but it is getting harder and harder to find...I invest hours and hours and hours! I noticed you also sell materials, some of which cost remarkable amounts for someone from the world of trout flies. What are some of the most expensive or rare materials that have passed through your hands? 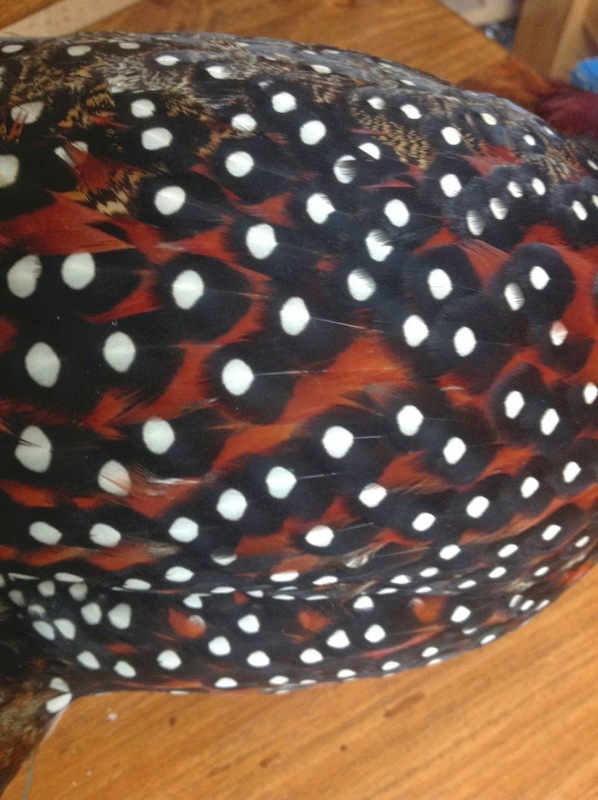 I am lucky enough to have one of the only whole Western Tragopans in Europe at the moment, which is difficult to value...but certainly several thousands, I also have items that belonged to Kelson himself, and some contents of two other rare collections. I also found a case of 5 Cotingas this year which cost up to 1,200 each for only £600...all in all I have in my possession every rare material for tying classic salmon flies, mostly from the period except one...which I hope to have in the next weeks to make my set complete. 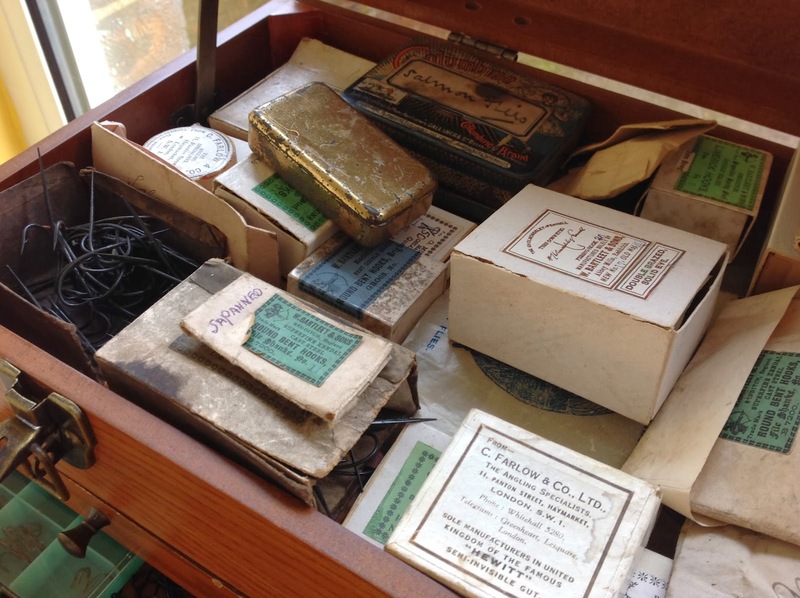 For me the collecting of materials has become as important as tying the flies themselves. As for my tying I am on a creative journey to establish my own style. 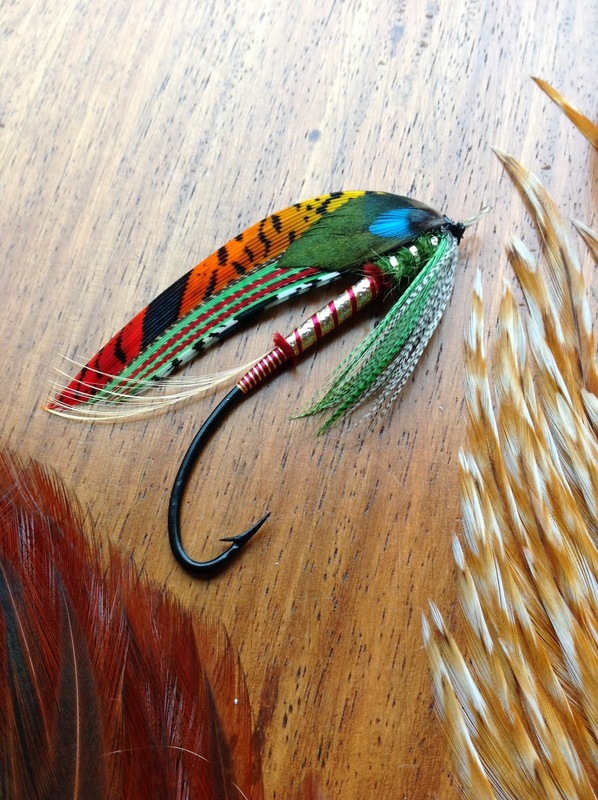 I tie what I consider to be mostly 'Classic Freestyles'...that is Freestyle Flies..inspired by classic patterns...rather than extravagant artistic flies. 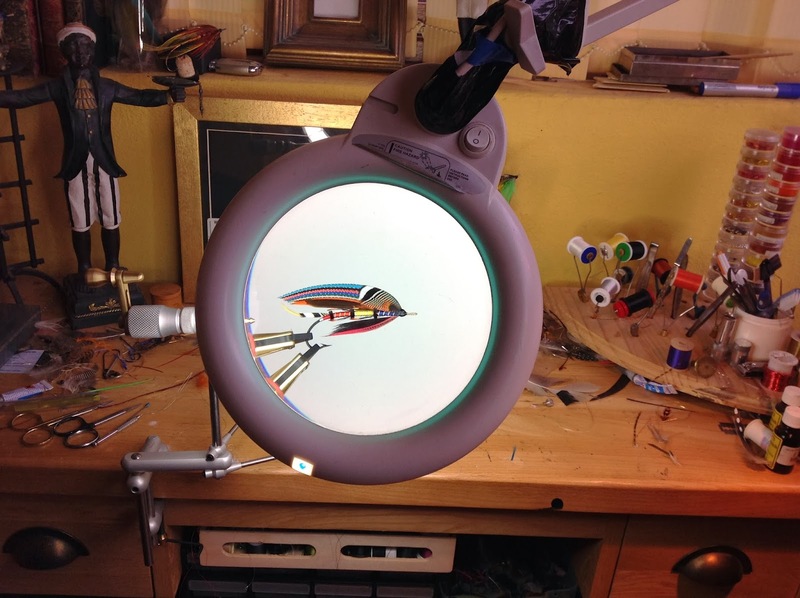 It has taken several years, but I feel I have just started to do this...and I now get quite a few commissions to make flies to order from people that obviously like them. I find the discipline of tying pure classics too restrictive for me and it stifles my creativity.....some people take it so seriously it is almost like a 're-enactment' hobby....pretty soon they'll be tying flies wearing the same clothes as the older generation! Above all it needs to be fun and creative for me....and if people also enjoy my work that is an added bonus..
More of Stuart Hardy's work can be seen (and ordered) on Facebook. If you're interested in learning more about tying salmon flies, the Classic Fly Tying forum is a good place to start, as well as Ronn Lucas Sr.'s excellent guide to getting started with full dress flies. Kiss the Water is an amazing film, available on iTunes, that delves into the fascinating story of one Megan Boyd, a woman who's flies were used by royalty, yet who never actually fished. A women who lived in solitude, perfecting her art for hours and hours a day, and famously refused an invitation to Buckingham palace because there was no one to look after her dog. They probably won't do for the discriminating and experienced salmon fly tier, but for the rest of us, a pack of 25 classic style salmon hooks from Allen Fly Fishing for less than 7 bucks can't be beat. And since they have free international shipping on a wide selection of hooks and beads, they're a favorite of mine! NIce article. and some great flies and info from Stuart. However, there is nothing classic about those hooks from Allen. Not to knock thier product, but for someone starting out in tying classic salmon flies, those are not the hooks to start with as the proportions of the shape of the hook are totally wrong for classic flies. I know, because I was that starter a little over 2 years ago. Thanks Eunan, that's good to know, I threw them in with a previous regular hook order on a whim. What would you suggest for the beginner who wants to try it out? Gaelic Supreme hooks are decent for beginners, but they're not made any longer, so whatever stocks are out there are gonna dry up eventually. You can also use old mustad sproats in 1/0-3/0 and lop the eye of them in a pinch. Of course there is the whole side project of reworking your own hooks when you get to a certainly level of skill and desired aesthetics. And then, there's Ronn Lucas beauties!